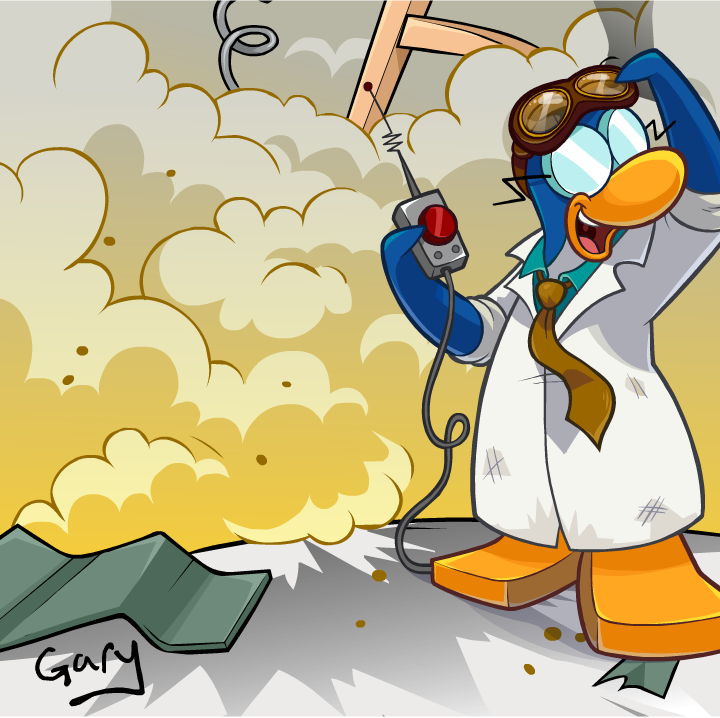 Construction for the Elite Penguin Force has started on CP today. 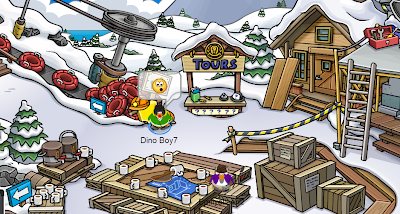 Head on over to the Ski Village, pick up your free mining helmet (if you don't have one already) and get to work! 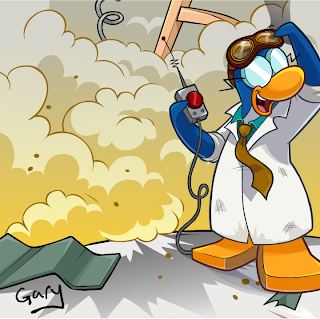 Since Operation Blackout ended, the EPF has been damaged and your help is needed to fix it. There are wooden boxes guys! WOODEN BOXES. That's serious business! Oh man, I can't wait for it to be fixed. Club Penguin said they will be bringing out new missions too. There's so much going on. Isn't it exciting? 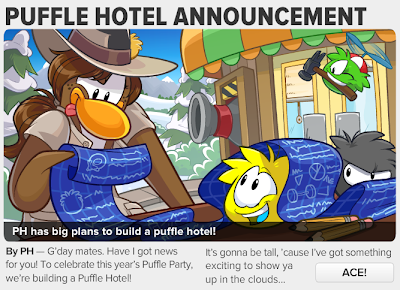 Also, in the newspaper PH has announced the puffle hotel, a brand new feature exclusively for this party! Club Penguin Celebrating Red Nose Day in the Coffee Shop! Disney have recently teamed up with Comic Relief to bring tears of laughter to Club Penguin over the next few days. I present to you... CP's first ever Red Nose Day! Yes, you can waddle over to the Coffee Shop, tell a joke on the "Make us LAUGH" stand and pick up your FREE Red Nose. What jokes have you told today? Remember, red nose day is on March 15th. 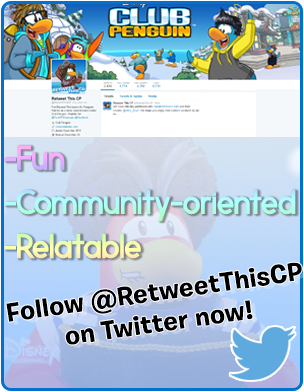 Today the 384th issue of the Club Penguin Times newspaper was launched on the island. 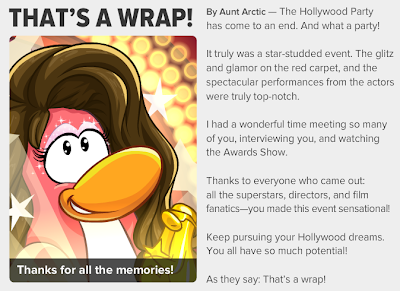 In this weeks issue, the Hollywood Party is wrapped up, and the Puffle Party is announced. "Puffle Hotel Announcement" by Puffle Handler. "That's a Wrap!" by Aunt Arctic. On now! Comedy Corner. Head to the Coffee Shop for some laughs! And get ready for ROFL's galore. Mar. 14. Igloo Furniture. 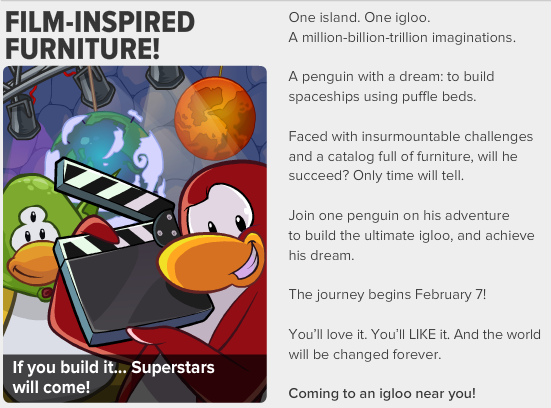 Every igloo could use a little more puffle - new furniture coming soon! Mar. 21. Puffle Party 2013. Rainbow Puffle Spotted in Club Penguin's Music Video! Hey penguins! Club Penguin have released a music video for their newest song, Puffle Party (Gotta Have a Wingman). The music video is excellent and really well made. 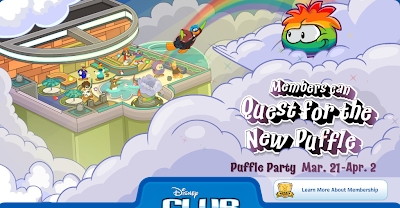 However, did you know that at the end of the video, you can see a Rainbow Puffle? Yep, the myth that penguins haven't stopped talking about since the birth of the famous puffles. Is this is a sign from Club Penguin to tell us that maybe they will be launched soon?? 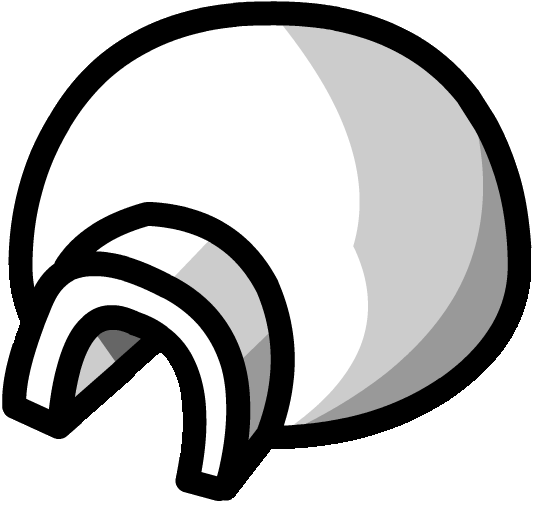 The puffle is seen winking at us, this could be one of it's personality traits. I think it would be good to keep as a pet! What would you name yours? I would call mine.... colorful (very original). The brand new Club Penguin song by Cadence and the Penguin Band is officially out. 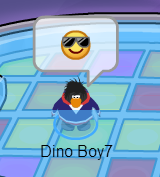 It is called "Puffle Party (Gotta Have a Wingman)". The CP team have released a music video for it and it is one of the tracks on Club Penguin's first ever album, "The Party Starts Now!" This album features 6 tracks and is available for purchasing on iTunes now for the price of £3.99 ($6.05). You can check out the music video for the new song below. I really enjoy this song. I hope I can buy the full album soon, as I am interested in hearing the awesome music! 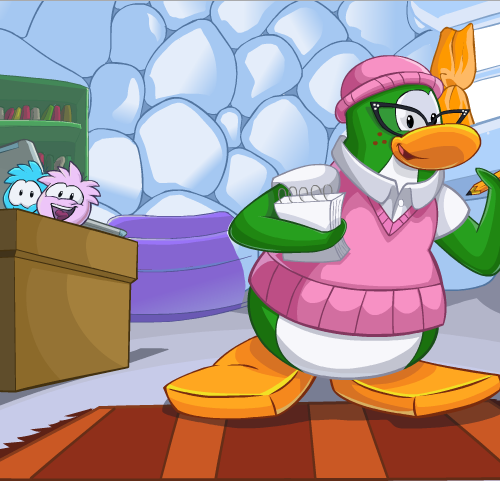 Did you like Puffle Party (Gotta Have a Wingman) by Cadence? Let me know by leaving a comment, I love hearing your feedback. Lights, camera, ACTION! 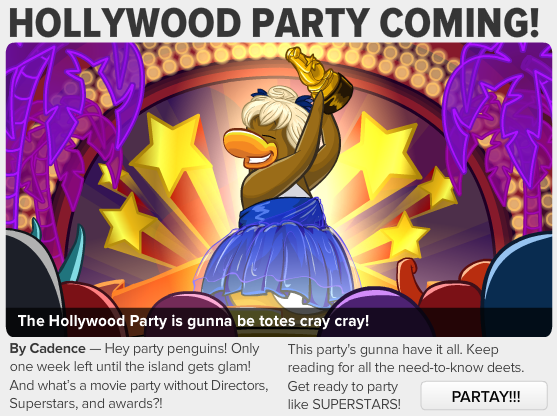 The Club Penguin Hollywood Party 2013 has arrived. 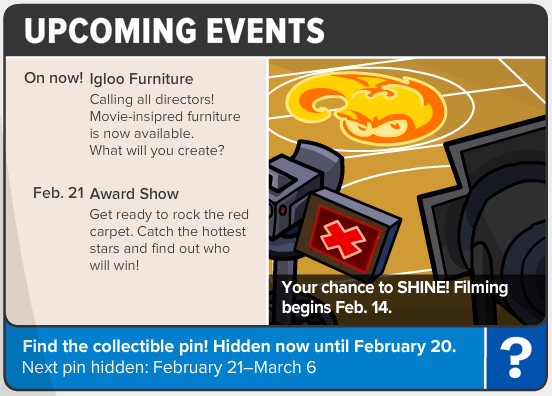 From February 14th to 26th, the island has been taken over and transformed into Hollywood! 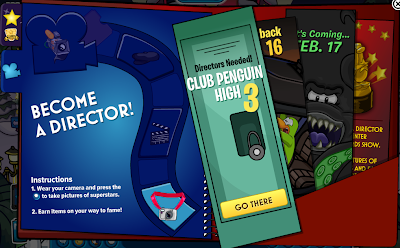 Normal penguins can become directors, actors, stunt-penguins and more! There's a lot to talk about so let's go. When you first log in to the island, you will be greeted with a message introducing the Hollywood Party 2013. It says we can become a director, and we can collect a camera item to fulfill this occupation. With the camera, we can take pictures of superstars! As we move on, you will notice that you can take part in a different movie every day. 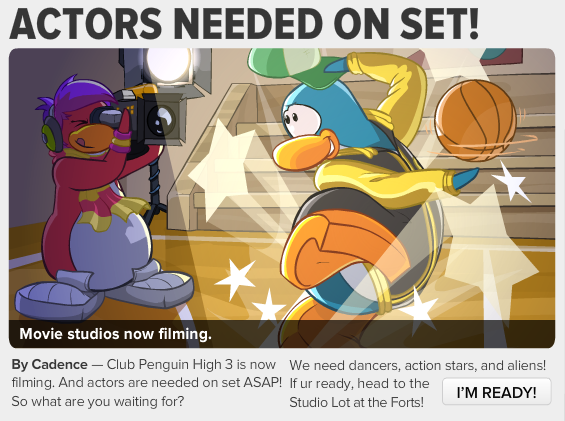 For the first movie, head over to the Snow Forts and enter 'Set A' where the filming for Club Penguin High 3 is taking place. Collect your studio item first. Then dance in the classroom, hallways, and gym to earn your background prize. Over the next few days, other movies will be filmed and your are needed for them. So don't miss out! 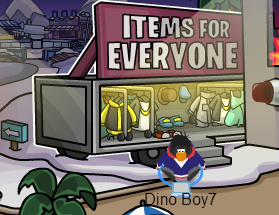 Also in the Snow Forts, there is a Hollywood catalog with items for everyone inside. Check it out. 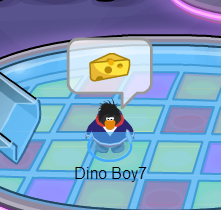 If you've done all you need to for today, waddle on over (or take a limousine) to the Town, and look at the cool decorations! I just love the mini fountain, don't you? 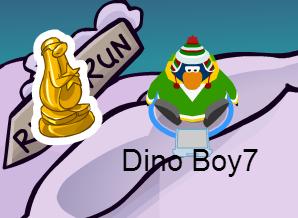 The limo's pull up every so often and you can hop in them to get around Club Penguin in style!! It is comfy, with its own pool and DJ table too. 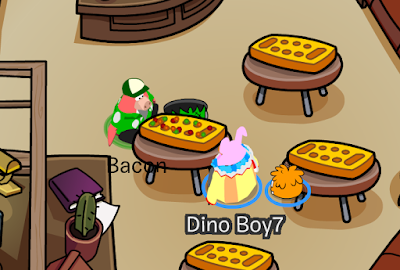 I hope you enjoyed my Club Penguin Hollywood party cheats for 2013. I'll see you soon to give you a walkthrough on other movies and features that are coming out at this party. Waddle on! 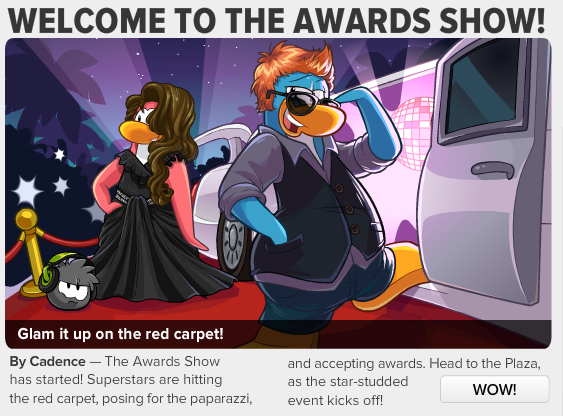 The Club Penguin Awards Show is here. 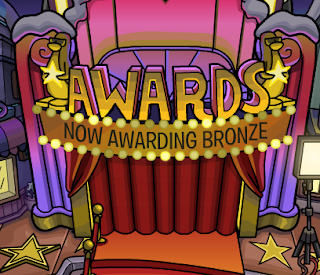 Head on over to the Stage and you could claim an award for doing what you do best! Club Penguin are currently handing out only bronze awards. The silver and gold awards will be handed out over the next few days (full details at the bottom). When you walk into the Stage you will notice that it has been refurbished for this ceremony. There is a massive screen and podium at the front for speeches and award-collecting. Here are the instructions. Bronze awards are being handed out now. 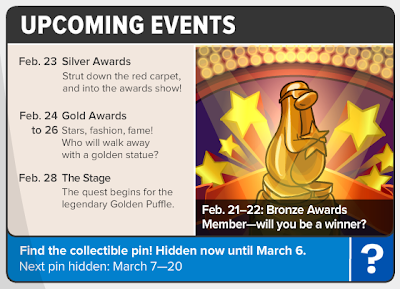 Silver and gold awards are being released on February 23rd, and 24th-26th. 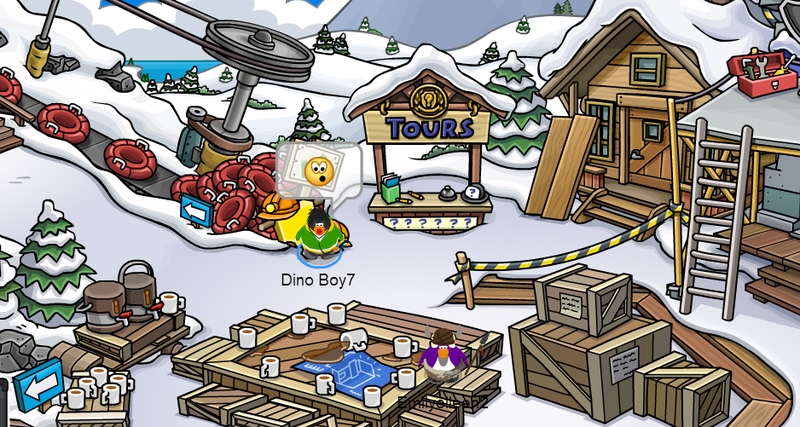 The new Club Penguin pin is out on the island. It is the fourth pin of the year. A new one is released every two weeks. It's related to the Awards Show which is currently on at the Stage. The pin we will be looking at today is the Golden Award pin. Scroll down for the cheats guide. Waddle over to the Ski Hill. You can now retrieve your collectible pin! The Club Penguin times is a newspaper dedicated to inform penguins of current and upcoming events, and some fun features. Today's issue is the 383rd and is the eighth edition of this year (2013). We have two articles, one of them from DJ Cadence welcoming us to The Club Penguin Awards Show. This one is presumably published by Aunt Arctic as it doesn't have a name and she writes out the newspapers. It's about the films at the Hollywood Party. I must say, they are pretty amazing to take part in! 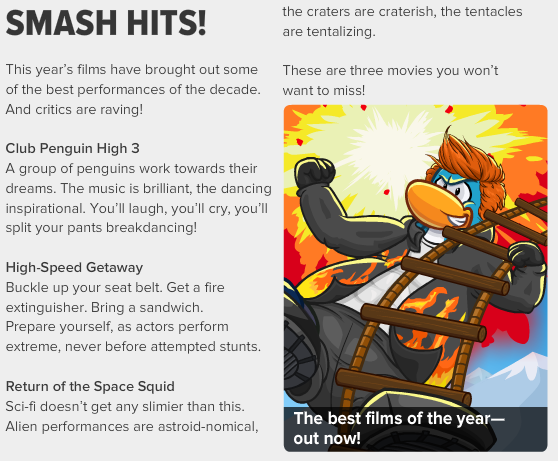 There are 3: Club Penguin High 3, High-Speed Getaway, and Return of the Space Squid. You can read about them below. Feb. 23. Silver Awards. Strut down the red carpet, and into the awards show! Feb. 24 to 26. Gold Awards handed out. Feb. 28. The Stage returns with the legendary Golden Puffle play. Cadence does not have a new giveaway background, only the two mascots featured above do. Waddle on! What do you think of the newest Hollywood-themed emotes? I really like them. 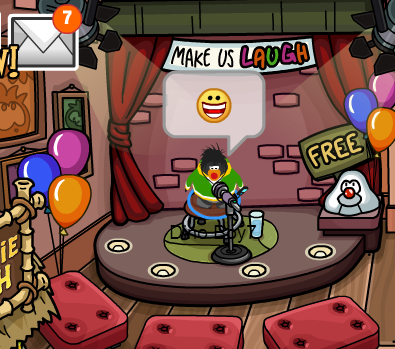 Club Penguin Times issue 382 was published on the island for penguins to read today. It is the seventh edition of 2013. Let's get into it! Cadence has made the first article "Actors Needed on Set!" 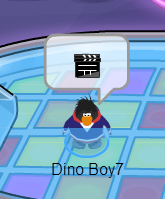 It's about a movie premiering on the island, Club Penguin High 3! Sounds like a generic Disney high school movie, doesn't it? The second article is called "Directors Needed" by the brilliant Aunt Arctic. 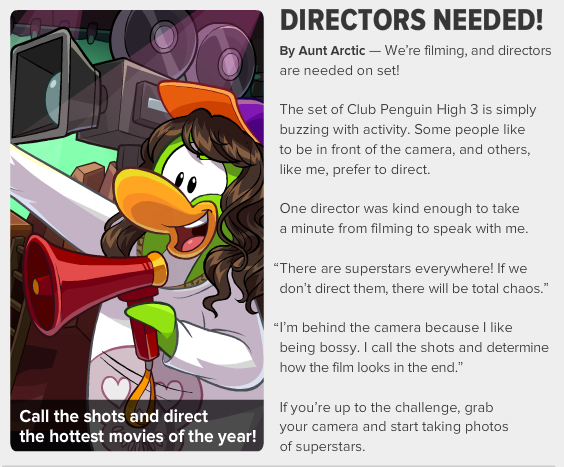 We're filming, and directors are needed on set! So with all this filming and actors and directors being needed, what exactly is going on? The Hollywood Party of course! Now Filming! Club Penguin High 3. Everyone has a dream, what's yours? Feb. 16. High-Speed Getaway. High-speed car chases. Extreme stunts. Explosions. Are you ready? Feb. 17. Return of the Space Squid. What happens when you go looking for extraterrestrial life? Daffodaily5 and Chattabox from the Club Penguin Team have posted a new video for us, it is an awesome announcement! We can celebrate Chinese New Year on CP with Sensei!! All we have to do is log on to the island on Monday 11th February on the server Mountain (timezones below). For Sensei to come on, we have to get as many penguins as possible wearing the Purple Dragon Costume that we can unlock for free using the code "HAPPCNY". The meetup times are: 4PM Australian Eastern Daylight Time 4PM Pacific Standard Time and 4PM Greenwich Mean Time. Club Penguin Penthouse Igloo Item Now Available! 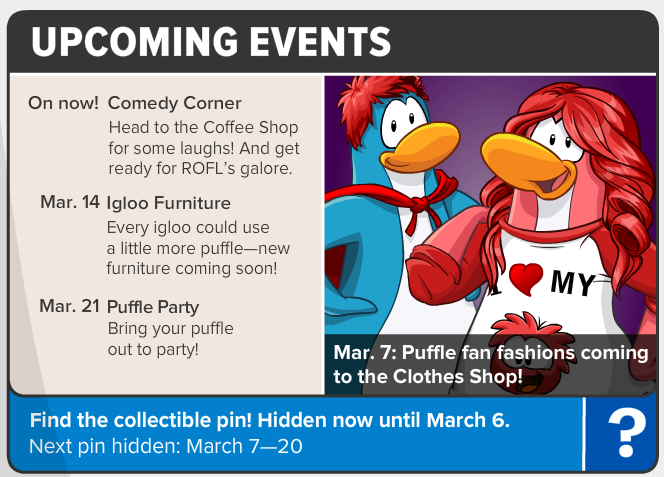 Club Penguin have released a Penthouse item in the most recent Igloo Catalog for members to buy. They have chosen to advertise it in the form of a log out screen. It looks like this. Members, throw the ultimate VIP Party! For a limited time, check it out in the Igloo Catalog in your igloo! 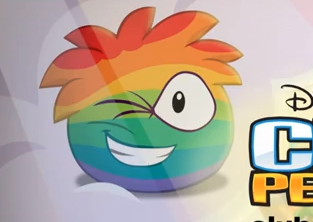 Rainbow Puffle Spotted in Club Penguin's Recent Video! Club Penguin uploaded a video on YouTube to advertise the Hollywood Party 2013. There is a hidden Easter egg. At around 0:16 seconds you can spot a RAINBOW PUFFLE on a penguins t-shirt. 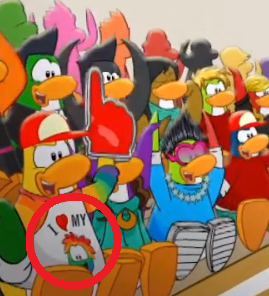 The penguin is yellow and wearing a red baseball cap, with a shirt saying "I LOVE MY" and then an image of what seems to be a rainbow puffle! 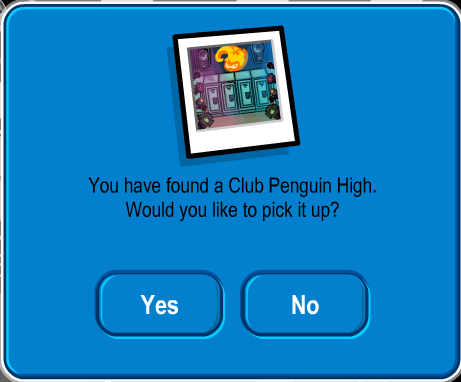 Is this a hint for something, or a trick of some sort Club Penguin are playing on us? I sure hope it's real, I would love to see a Rainbow Puffle on the island! 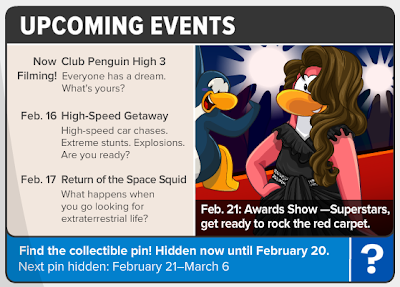 Club Penguin have released a new pin on the island for us penguins to find and collect in our inventories. It is the Shooting Star pin, and closely related to the upcoming Hollywood Party. Here's a cheats guide to help you find it. Head on over to the Plaza. Click on the manhole cover to enter the Cave. Once in the Cave, click on the pin in the bottom right corner. 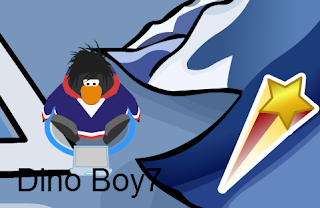 You now have the newest Shooting Star Pin on Club Penguin! The new Club Penguin Times issue is out. The sixth edition of 2013 is here and it is all about the Hollywood Party that will be arriving on the island next week (February 14th to be exact). Let's check it out! The first article for this weeks newspaper is called "Hollywood Party Coming!" by Cadence. It is all about how amazing the party is going to be. The second article has no name published on it by it is presumably by Cadence too. It is called "Film-Inspired Furniture!" On now! Igloo Furniture. Calling all directors! Movie inspired furniture is now available. What will you create? Feb. 21. Award Show. Get ready to rock the red carpet. Catch the hottest stars and find out who will win! Club Penguin has brought out a new video in which UK X Factor star Ella Henderson discusses with us: Safer Internet Day. She tells us how we can learn to connect and stay safe online, to prevent online bullying and harassment. You can watch the YouTube video below. This is a very important message that needs to be shared. That's why Disney are sharing this idea by campaigning with other companies and advertising Safer Internet Day on February 5th 2013. They will be doing this online, in their magazines, and other places. Remember to stay safe online penguins!